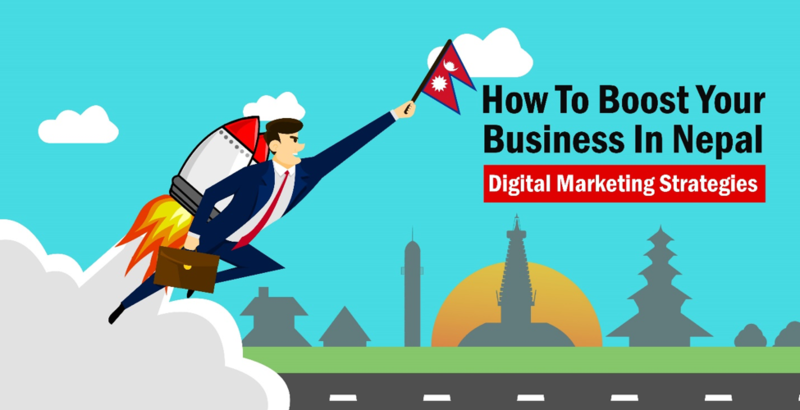 There are certain common tricks used by businesses when it comes to digital marketing strategy in Nepal. These strategies are used in a serial order; these are sort of like steps towards achieving desired results. Digital Marketing is all about how well a business understands and works towards increasing, its existing customer base, by the means of various online marketing tools. Digital Marketing is valuable not just because it helps boost sales in a company, but also because it helps build a brand. However, one thing that must be kept in mind is that it’s not a child’s play, and nothing happens accidentally here. Research and Planning are the two main things that set the founding stone of this huge marketing process. Without proper strategy, execution, short-term, and long-term goals, and counter strategies, there is no to very little chance for the process to offer the expected results. It is low in cost and resources in comparison to the traditional marketing techniques, but what it demands is a proper understanding of the process, and dedication towards making it the success. Involvement in digital marketing requires the company to own a decent website, most probably Search Engine Optimized, or in case of lack of resources, one or multiple social media pages. It is required by the companies to have good knowledge of SEO in Nepal before they embark on this journey. After these, all they need to have in their sleeves is a full proof strategy to use these platforms in the favor of their businesses. There are certain common tricks used by businesses when it comes to digital marketing strategy in Nepal. These strategies are used in a serial order; these are sort of like steps towards achieving desired results. As soon as a company launches a website, or creates a social media page, they start working towards increasing the number of visits. Growing traffic is an indication that the site/ page is doing extremely well. To gain traffic in a site/ page, it needs to be promoted in various other highly trafficked social media pages and website. And this is where Social Media Marketing comes to play. Big budgeted companies don’t fall short in terms of using their resources. They organize competitions and events, both online and offline to attract visitors to their site or page. Requests are sent through social media and other mediums to friends, acquaintances, and even strangers to visit the site/ page. After the site/ page has gained a decent amount of traffic, mainly daily visits, now it’s time to aware the visitors about the products and services that the company offers. Companies owning a website have more creative freedom when it comes to content, rather than the ones owning a simple social media page. All kinds of content ranging from plain texts to multimedia could be posted. Good quality content doesn’t just aware the existing visitors but also plays a great role in inviting new ones. The next step is trying to understand the visitors coming to the site/ page. The reason why it’s important to know the customer is because only by being aware of the visitors the company can identify their target group. This process also helps the companies gather their contact info, which will be helpful in the upcoming strategy. Gathering User Info also helps the company reform their strategy as per the need; it helps them realize whether they’re going in the right direction. Information about visitors can be gathered through the contact us page, newsletter subscription page, query page and so on, by making the customer fill a form before going any further with the particular process. Collecting information in social media is comparatively easier, especially when they have liked the page. Social Media Marketing could also be used to gather user info from social media pages. The next digital marketing strategy in Nepal in the process is influencing customers to make a move, which could either be as direct as buying our product or an indirect one like ask a question. In the case of social media, the first and most important call to action is to ask the visitors to like the page. This step is not necessarily the fourth one, businesses can call the visitors for action instantly after their site or page is launched. Generally, call to actions is planned serially, like pit-stops, starting from a very small thing to do to ultimately buying the product or taking the service itself. This is where maximum planning is required. The company must be subtle in their approach, without risking being passive; call to action must create a sense of urgency, but at the same time it shouldn’t reflect desperation. The next thing that the companies tend to do is use the contact information of the visitors that they gathered earlier, and communicate with them, mostly via email. Generally, special offers on product and services, news and information about the company, product or service, festive wishes and so on are sent, with a hope that the visitor responds, and conversion, in any form, happens. All the five strategies mentioned above are ongoing processes. You don’t jump from the first one to the second; you initiate the second activity, while you’re doing the first one. And as I said earlier, the biggest part of a digital marketing strategy in Nepal is to learn from the mistakes and continuously evolve and re-strategize. Digital Marketing is, undoubtedly, the most dynamic field of marketing that exists currently. Despite offering the challenges to the businesses, it also offers opportunities and unfathomable results, the only things required are a vision and hard work. There are many companies out there that offer proper SEO Training in Nepal to help the businesses properly understand the field of SEO and Digital Marketing. Businesses should definitely consider taking help from these companies to become better at using these online tools in their favor. This guest article was posted by Elance Digital Media.